Greece - HISTORY'S HISTORIESYou are history. We are the future. 1. 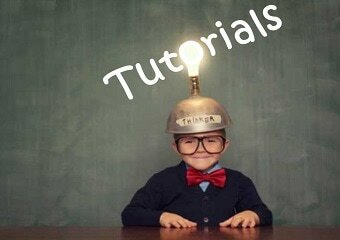 GEOGRAPHY: As you know, geography is the study of how humans interact with their environment. Just as geography played a major role in how the civilizations of Mesopotamia, Egypt, China, and India developed, the geography of Greece determined how Greek culture grew and spread throughout the ancient world. 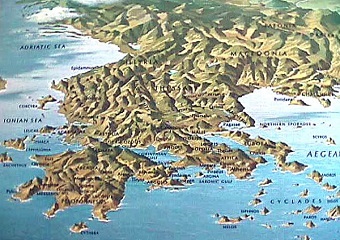 The geography of Greece, however, is different from the geography of the other civilizations you have studied this year. Mesopotamia, Egypt, China, and Indian civilizations all began along side rivers. By contrast, Greece doesn't have many large rivers. What it does have is lots and lots of coastline. Compared to the other civilizations you've studied, Greece is also quite small. Yet, in the ancient world it rose to unparalleled greatness and its influence is still felt today. Because of its rich legacy of artistic, political, and philosophical achievements, many consider Greece to be the true birthplace of Western civilization. 2. 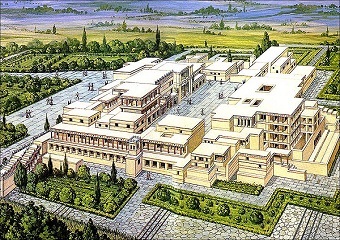 THE MINOANS: The earliest Greek civilization, the Minoan, sprung up on the isle of Crete over 8000 years ago. Most likely, the earliest settlers came by boat from Asia Minor, present day Turkey. For thousands of years they lived peacefully in caves and in simple huts, isolated from the rest of the world. Unlike mainland Greece and the Peloponnesus Peninsula, however, Crete's land supported agriculture. Further, these early Greeks could not have asked for a better, more strategically placed position in the Mediterranean. They were square in the middle of Mediterranean trading routes that led in all directions of the compass. Because of those geographic features, these early settlers gradually developed more sophisticated skills and eventually grew to be a major power in the region. 3. THE AGE OF HEROES: After suffering a series of natural disasters, the Minoan Civilization on Crete weakened. 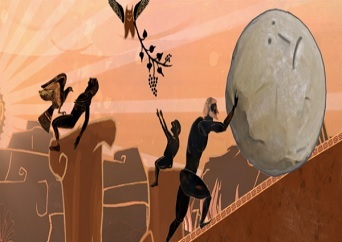 Across the Mediterranean at this time, on the Peloponnesus Peninsula area of the Greek mainland, a group of people called the Mycenaeans were growing ever stronger. 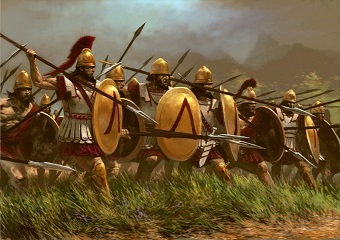 The Mycenaeans were led by great kings and they believed themselves to be great warriors and they loved a good fight. They fought everyone with whom they came in contact. As a result, the Mycenaean age gave birth to myths and stories still told today. It is because of those tales that we refer to this time period as the "Age of Heroes." Later, it was those very stories and the people who told them that rescued Greece from the Dark Ages that followed the fall of Mycenae. 4. THE RISE OF THE CITY-STATE - ATHENS: Because of the limits on growth imposed by Greek geography, ancient Greece developed along distinct lines. Instead of uniting as a nation-state, ancient Greece was made up of dozens of city-states, many of them quite great. Because these city-states had different ways of doing things and different forms of government, Greek city-states often competed against one another in both friendly and not so friendly ways. At stake was the pride that came with your place of birth. 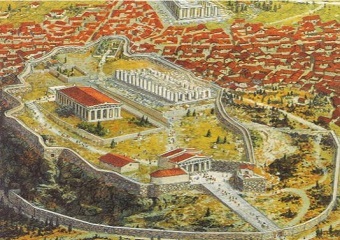 One of the great city-states, not just of ancient Greece but of all time, was Athens. 5. THE RISE OF THE CITY-STATE - SPARTA: From a cultural perspective, Sparta was in many ways the opposite pole to Athens. In Sparta, their social structure, with military training at its core, allowed all Spartans some form of equality. While in Athens, civic participation was restricted to a small segment of society. Both daily life and education were very different in Sparta than they were in the other city-states. With the exception of the Athenians (who thought Athens was the best!) 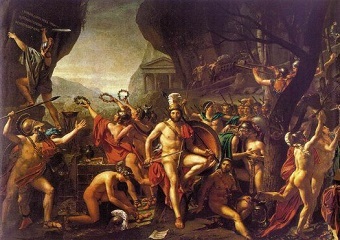 Greeks from other city-states had a grudging admiration for the Spartans. They wouldn't want to be Spartans, but in times of war, they most certainly wanted Sparta to be on their side. The Spartans were tough, and the ancient Greeks admired strength. 6. THE PERSIAN WARS: In 500 BCE, the Persian Empire stretched from the Mediterranean Sea all the way to the Indus River in Pakistan. At that time, the Greek city-states were not united, and they were tiny compared to the size and population of the vast Persian Empire. In 499 BCE, several cities on the coast of modern-day Turkey, cities that had been founded by the Greeks, rebelled against the Persian rule. 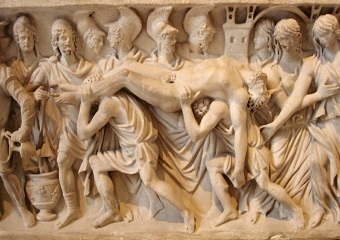 Athens sent ships and supplies to help these cities. This made the Persian emperor, Darius, very angry. He decided to teach the Greeks a lesson. He used the revolt and subsequent Athenian aid as an excuse to invade and conquer Greece. He gathered together his army and navy and invaded Greece. When he landed his fleet on the plain of Marathon, just north of Athens, in 490 BCE, the Persian Wars officially began, and the rest - as they say - is history. 7. 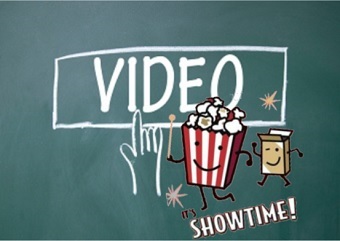 GREECE PROJECT: ​To wrap up your Greek Unit, you will work with classmates to write and produce a newscast about ancient Greece. We'll call it Old News. As with all of your projects, success will depend on combining creativity with good 6th grade research. This project allows you to both work independently to discover even more about ancient Greece and to collaborate with classmates. Just like the ancient Greeks did, you will need to discuss your ideas with other members of your group. Once your group establishes a plan for success, you must work together to make your project great. Your newscast will feature segments from the front lines of a battle, a critic's corner report from the culture desk, a report from the political news team, a sports report, a technology report, and an interview.